The Romans were as particular about cleanliness as we are in modern times. This public bathhouse, known today as the Forum Baths because of its location, was built soon after the Roman conquest in 80 B.C. The residents of Pompeii, both slave and free, who lived in the neighborhood would bathe here daily at public expense. This building was found well preserved when excavated in 1823. A men's entrance. B women's entrance. 1 men's apodyterium, or dressing room. 2 frigidarium, or cold bath. 3 tepidarium, or warm bath. 4 calidarium, or hot bath. 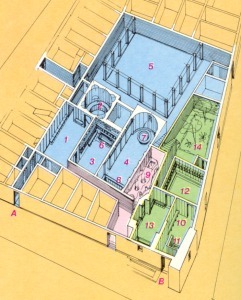 5 palaestra, or gymnasium. 6 bronze brazier and seats. 7 basin for ablutions. 8 bathtub. 9 furnaces for air and water at different temperatures, serving the facilities for both men and women. 10 women's dressing room. 11 tub for cold bath. 12 tepidarium. 13 calidarium. 14 open-air courtyard.